Town in the country of Hamath. It is now an insignificant hamlet, known as Riblah, in the Baḳa'ah, the broad valley between the two ranges of Lebanon and Hermon, and on the eastern shore of Nahr el-'Aṣi (Orontes), thirty-five miles northeast of Baalbek. Its position on the banks of a mountain stream, in the center of a vast and fertile plain, and close to the road leading from Egypt and Palestine to Babylon, rendered it a frequent resting-place for the armies of the Egyptian and Babylonian kings. It was at Riblah that Pharaoh-nechoh, after having defeated Josiah at Megiddo, put the latter's successor, Jehoahaz, in "bands" that he might not reign in Jerusalem (II Kings xxiii. 33). It was at Riblah also that Nebuchadnezzar established his headquarters when his army besieged Jerusalem (586 B.C. ), and it was here that Zedekiah was brought before him for judgment (II Kings xxv. 6 et seq., 20-21; Jer. xxxix. 5-6; lii. 9 et seq., 26-27). 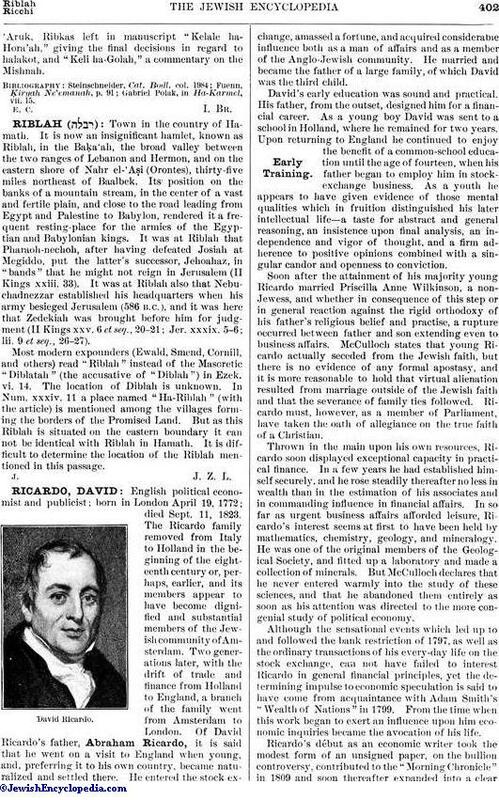 Most modern expounders (Ewald, Smend, Cornill, and others) read "Riblah" instead of the Masoretic "Diblatah" (the accusative of "Diblah") in Ezek. vi. 14 The location of Diblah is unknown. In Num. xxxiv. 11 a place named "Ha-Riblah" (with the article) is mentioned among the villages forming the borders of the Promised Land. But as this Riblah is situated on the eastern boundary it can not be identical with Riblah in Hamath. It is difficult to determine the location of the Riblah mentioned in this passage.